Following on from last week’s Alternative Investing Show, today we’re going to look at stamps and coins as an asset class. Are they a practical option for the UK retail private investor? The case for strong returns is built on rarity – they aren’t making any more old coins and stamps. So that’s supply sorted. The other question is demand. Here in the UK, collecting stamps and coins – which is quite different to investing in them – is seen as a dying hobby for the over 50s. But there is evidence of growing interest from (younger) collectors in India and China. 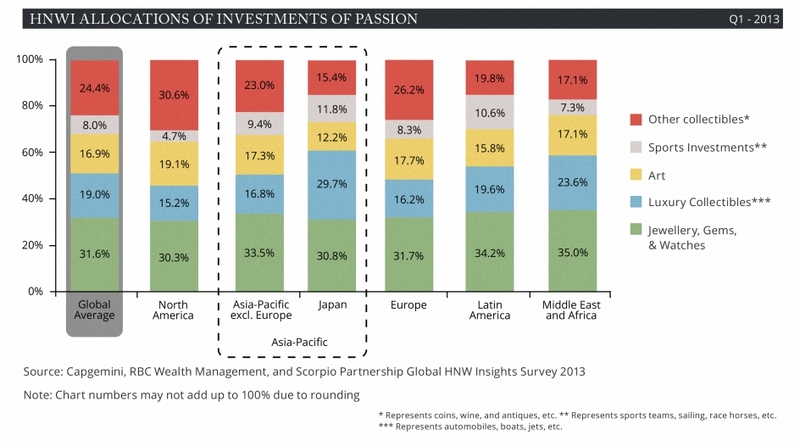 Cap Gemini’s World Wealth Report tracks investments by high net worth individuals (HNWIs) in Investments of Passion (IoPs). It seems that the financial crisis of 2008 had a significant impact on spending on art, antiques, cars, stamps and coins, but this effect was short lived. 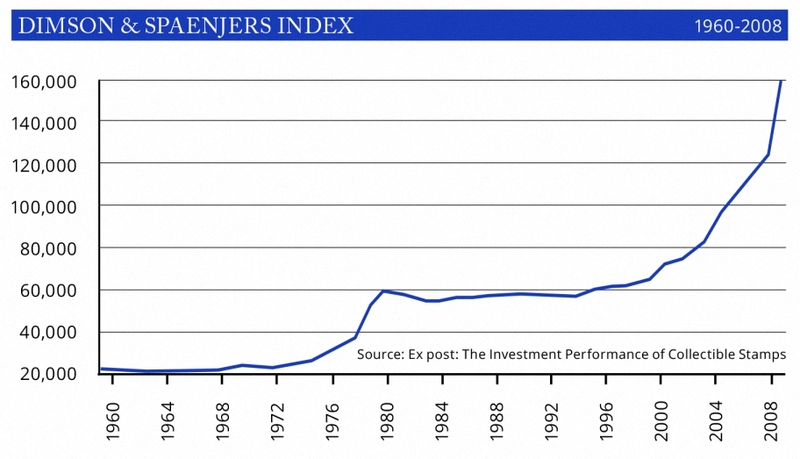 Demand has now recovered, and a trend towards “investor-collectors” – rather than just collectors – has been detected. Jewellery, gems and watches remain more popular than stamps and coins. 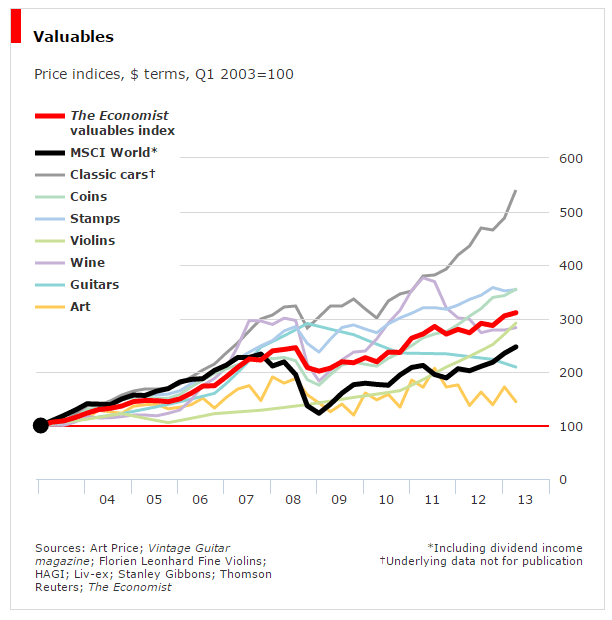 The Economist Valuables Index is weighted according to Barclays wealth management clients’ portfolios: 17% hold coins and only 6% stamps. They have at least performed well: over 10 years to 2013, stamps and coins each returned 250% profit, compared to 150% for the MSCI World Index of stocks (dividends included). As you might expect, the stamp collecting market is shrinking in the West and growing in the East. Both of the stamp indices and the coin index are listed on Bloomberg (STIGIGB30, STIGIGB25 and STIGIRCIX). 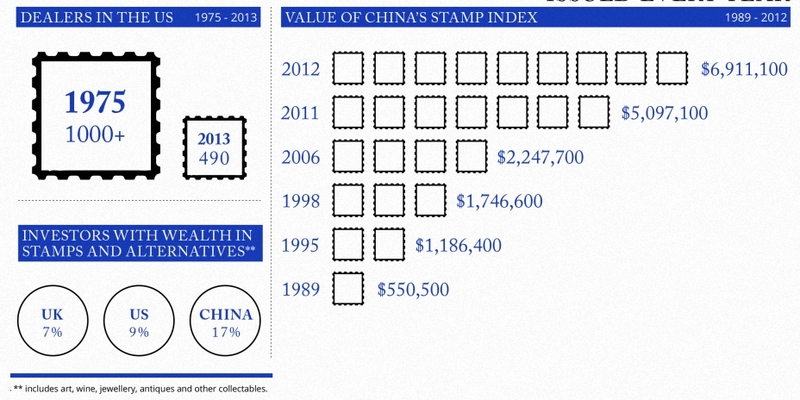 SG also track an index of 200 Chinese stamps which has shown annual growth of 10.7% over 25 years, but has been more volatile than the GB stamp indices. 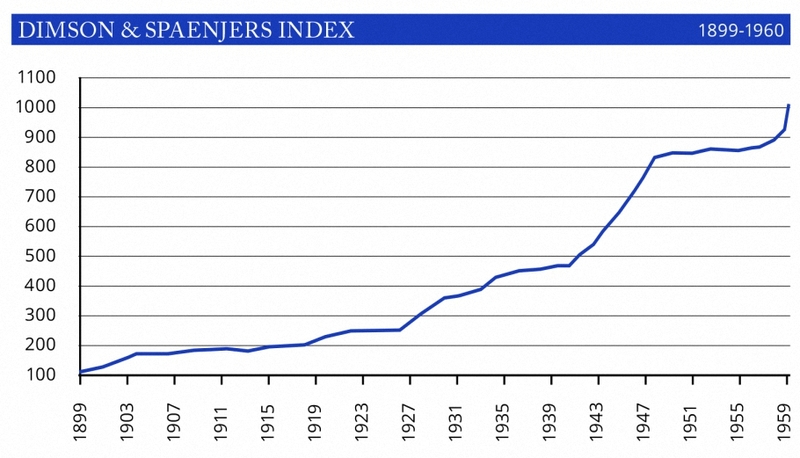 In Ex Post: The Investment Performance of Collectible Stamps, Dimson and Spaenjers (2010) looked at British stamps from 1899 to 2008. 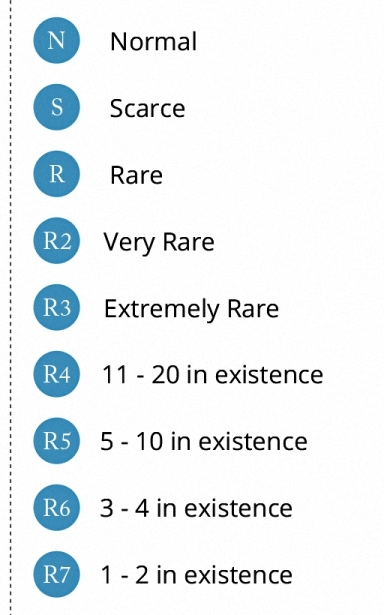 They excluded “special varieties” (rare and valuable stamps) which make up more than half of the SG indices. Annual compound growth was 7% over 109 years, 7% over 20 years and 12.7% over 10 years. There was a price bubble in the 1970s, lower returns in the 80s and 90s, strong growth in the 2000s before the financial crisis, and steady but slower growth since then. Attitudes to diversification vary. Some people think 5 stocks are enough, some 30, others 1000.2 What we can say for sure is that 10 holdings are much better than one, and 20 holdings are significantly better than 10. It should also be remembered that the proposed stamps and coins portfolio is being added to stocks, bonds, property, cash infrastructure and commodities to provide additional diversification. Perfect diversification within the stamps and coins portfolio itself, though welcome, is not mandatory. Without knowing more about the components of the SG indices, it’s impossible to say what size portfolio will be required for reasonable diversification. Informal conversations at the Alternative Investing Show lead me to believe that £25K might be enough, spread across perhaps 15 coins and stamps. This seems light to me, and I am prepared for this figure to rise. The PPB probably comes closest to what is required, but the minimum contributions and the SG profit share are too high. the average annual charge over 10 years will be more like the mean of these, or 6.3% pa! the average annual charge over 10 years will be more like the mean of these, or 4.6% pa! So even with a £70K portfolio held for 10 years and increasing substantially in value, the annual charge is around 4.6%. There are no tax shelters available for coins and stamps, so we are relying on the annual capital gains tax allowance of £11,100 in order to shelter any gains. Stamps and coins are unregulated, and treated as personal property rather than financial securities. They are not covered by the Financial Services Compensation Scheme (FSCS) or the Financial Ombudsman Scheme (FOS). However, should a broker like SG go bust, the assets themselves would still be owned by the investor, and could be sold on the open market. Interesting analysis of how to invest with SG. SIgn me up.